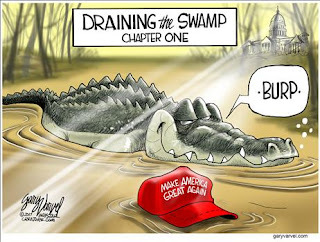 When voters from "Fly Over Country" came out of the woodwork last November to cast a ballot for Donald Trump and a change of course, little did they realize how murky and dangerous the swamp in Washington DC really was. They knew that Mr. Trump would more than likely hit some fierce opposition from the Democrats and maybe some of the establishment Republicans would bellow a bit but nobody could forsee this mess we are now wading through. It has become high political theatre and the media has kept it fully charged and continued to stoke the flames of discord and resistance. Through all the drama one thing is perfectly clear. The Democrats have been effective in stalling and obstructing any legislation to change course.